Our two UF Health Shands outpatient ancillary services at Ayers Medical Plaza on Southwest 2nd Avenue — the UF Health Shands Pharmacy and UF Health Shands Laboratory — have vacated that location following careful assessment. The UF Health Shands Laboratory at Ayers closed in June. The team there had seen fewer patients for blood draws throughout the years. Meanwhile, the outpatient lab at the original UF Health Springhill building relocated to the new adjacent Springhill building that opened on Aug. 6. UF Health Shands also has three other outpatient lab locations, including two on our Archer Road campus. Meanwhile, the UF Health Shands Pharmacy at Ayers closed on Aug. 1. 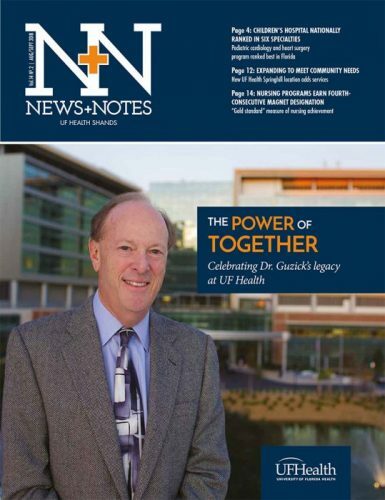 It began operation at the new UF Health Springhill building on Aug. 6. UF Health Shands provides pharmaceutical services for patients of our hospitals and clinics as well as the Gainesville community. The Springhill pharmacy location makes it the first retail pharmacy on the northwest side of town. Patients will continue to receive the same services that were offered at the Ayers location. Prescription mail service, the most-used service at Ayers, will continue for employees at over 30 off-site locations. “This move will hopefully be an opportunity to not only serve patients at the two UF Health Springhill locations, but also UF Health Springhill Emergency Center patients as well,” said Kara Berasi, UF Health Shands Pharmacy ambulatory pharmacy services assistant director. Transferring prescriptions to any of our pharmacies is easy. With the Ayers move and closure, take a look at our other locations through Gainesville for pharmacy and lab services.